Zinc alloy putter with steel shaft and black rubber grip. Available in right or left handed. 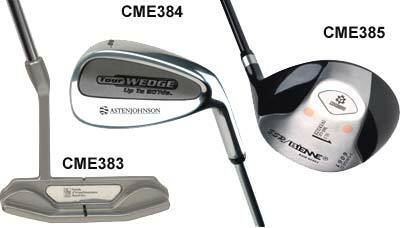 Pitching wedge - 60º zinc alloy, steel shaft and black rubber drip. Available inright or left handed. Aluminum alloy driver 70% Graphite & 30% Glass shaft, with black rubber grip and 10.5º loft. Available in right or left handed. Putter - Product Size: Total length 35", Imprint area 1-1/2" x 5/16"
Wedge - Product Size: Total length 36-1/4", Imprint area 2" x 3/8"
Driver - Product Size: Total length 45", Imprint area 5/8" x 3/8"